Nikola Milutinov of Olympiacos Piraeus and Ricky Hickman of Brose Bamberg faced games of very different importance in Round 28, but on Friday night both players emerged having one thing in common – the highest performance index rating among players on winning teams, good enough for them to become co-MVPs of the Round. Milutinov earned the first such distinction of his 107-game career by leading Olympiacos to 89-82 win over Anadolu Efes Istanbul that assured the Reds home-court advantage in the playoffs. Milutinov set a career high with 26 points, shooting 8 for 9 on two-pointers and 4 for 5 from the free throw line. The big man also had 8 rebounds, 2 assists and 1 steal and a PIR of 29, another career high. 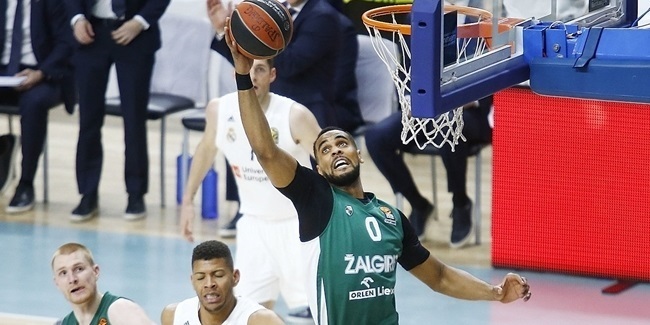 Hickman shined for previously-eliminated Brose in a 93-88 win over Unicaja Malaga with 28 points, which was the second-highest total in his six EuroLeague seasons. He made 3 of 5 two-pointers, shot 3 of 4 behind the arc, and made 13 of 15 free throws. Hickman also contributed 2 assists, 2 steals, 1 rebound and 7 fouls drawn for a PIR of 29, earning his fourth MVP of the Round honor. 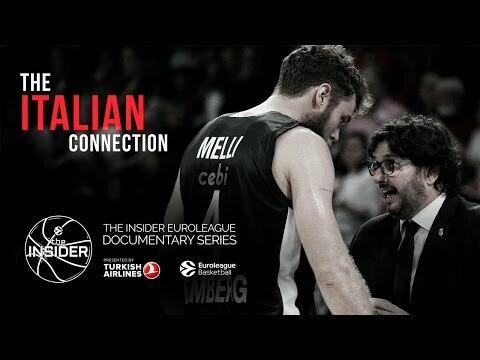 Two players on the losing end of their games, Vladimir Micov of AX Armani Exchange Olimpia Milan and DeAndre Kane of Maccabi FOX Tel Aviv, shared the highest index rating in Round 28. Micov was on fire, netting a career-highs 27 points on 7 three-pointers in 9 attempts for an index rating of 34. The veteran forward also had 5 rebounds and 4 assists in a home loss to Valencia Basket. Kane had the best game of his debut EuroLeague season with 19 points, 9 rebounds, 5 assists, 3 steals, 1 block and 6 fouls drawn, but his PIR of 34 came in a home loss against Panathinaikos Superfoods Athens. Rounding out the list of top performers in Round 28 is Ali Muhammed of reigning champion Fenerbahce Dogus Istanbul, who in fewer than 19 minutes on the floor scored 25 points, with 3 rebounds, 1 assist and 1 steal, for an index rating of 28 in a road win over Crvena Zvezda mts Belgrade. Hickman was this round's top scorer with 28 points. Alexey Shved of Khimki Moscow Region remains the league lead with 21.8 points per game. Chris Singleton of Panathinaikos had 10 rebounds, the most of all players in Round 28. James Augustine of Unicaja Malaga is the EuroLeague leader in rebounding for the season with 6.8 per contest. 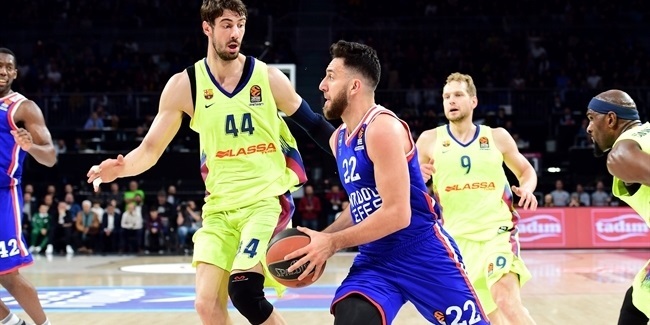 Five players had 8 assists this round: Shved, Facundo Campazzo of Real Madrid, Krunoslav Simon of Efes, Sergio Rodriguez of CSKA Moscow and Vassilis Spanoulis of Olympiacos. 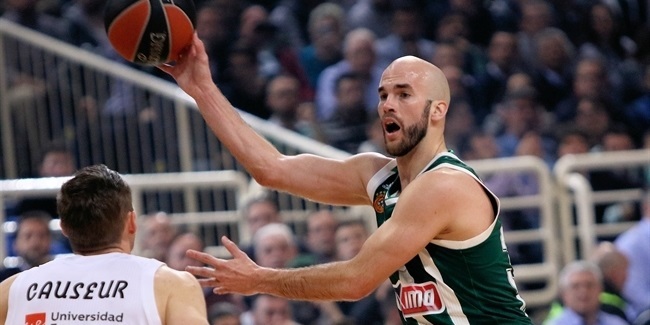 The runaway league leader in this category is Nick Calathes of Panathinaikos, who averages 8.2 per game. Leading the way with 4 steals in Round 28 were Mike James of Panathinaikos, Janis Timma of Baskonia Vitoria Gasteiz and Edwin Jackson of FC Barcelona Lassa. Calathes is the league leader in steals, too, with 1.7 on average. Bryant Dunston of Efes, Alex Tyus of Maccabi and Barcelona's Pierre Oriola had 2 blocks apiece, the most in this round. Dunston is EuroLeague's season-long shot-blocking leader with 1.8 per game.